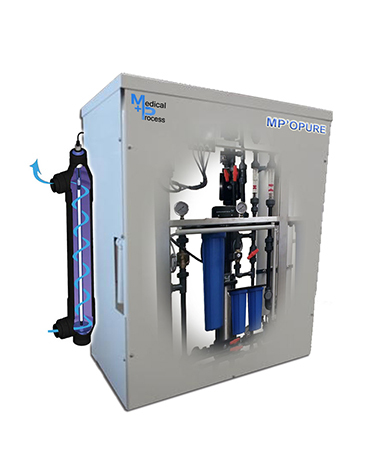 MP’OPURE stops Legionella and germs growth and spread in buildings thanks to its absolute filtration, chlorination and UV treatment. The MP’OPURE system delivers biologically controlled water for the use of medical units with high infection risks. MP’OPURE regroups different water treatment units commonly integrated into the scrub sinks in order to centralize that treatment. This process secures the whole loop, and provides a better efficiency while saving on consumables. MP’OPURE integrates a 5µ prefiltration, then a continuous UVc radiation inside the loop added to an absolute 1µ and 5µ filtration. It is also possible to add an optionnal chlorination process proportional to the water volume. To complete this process and double the security, the water is filtered at 0.2µ through terminal filters installed on our surgical sink taps. A 50 second automatic purge is programmed 6h after the last utilization of our scrub sinks to avoid stagnation. Filtration of 5µ, 1µ, 0.5µ then 0.2µ absolute filtration.